CINCINNATI — A U.S. magistrate ordered on Tuesday that the man accused of claiming to be a missing boy from Illinois be detained pending his trial. When neighbors found 23-year-old Brian Michael Rini wandering the streets of Newport, Kentucky on Wednesday, he told them he was Timmothy Pitzen, a 14-year-old boy who had been missing for years, according to federal officials. 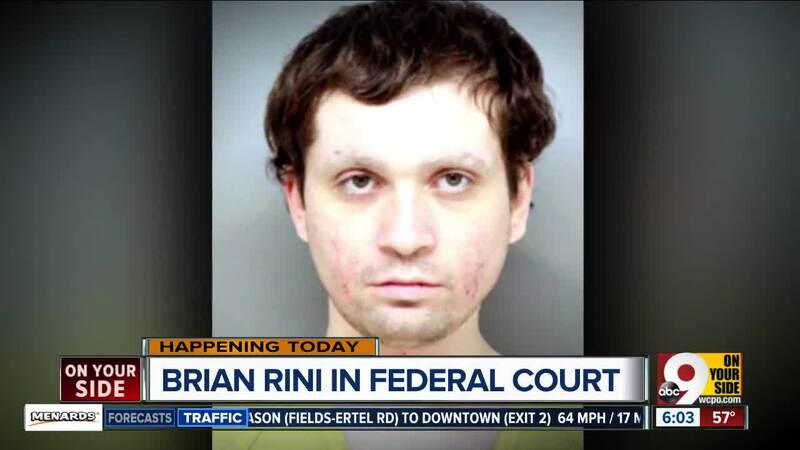 Authorities will continue to hold Rini in jail because of his criminal record, flight risk, lack of identifiable residence, active warrants and mental health history, the magistrate said in court during a hearing Tuesday. According to an affidavit filed in federal court, Rini said his name was Timmothy Pitzen, he'd been abducted when he was 6 years old and he just wanted to go home. After Newport police officers made contact with him Wednesday, Rini complained of abdominal pain and was driven to Cincinnati Children's Hospital Medical Center. He also claimed he'd recently escaped from a hotel room where two men had been holding him captive, and that he'd been sexually and physically abused while in captivity, according to the affidavit. Timmothy Pitzen (left) around the time he went missing and a rendering (right) of what he might look like today. Authorities have asked anyone with genuine information about the case to call Aurora police at 630-256-5000 or the National Center for Missing and Exploited Children at 1-800-843-5678. The FBI asked anyone with information about Rini's activities over the past few months to call 1-800-225-5324.